Welcome to the LitCharts study guide on Jacqueline Woodson's Brown Girl Dreaming. Created by the original team behind SparkNotes, LitCharts are the world's best literature guides. A concise biography of Jacqueline Woodson plus historical and literary context for Brown Girl Dreaming. A quick-reference summary: Brown Girl Dreaming on a single page. In-depth summary and analysis of every Part of Brown Girl Dreaming. Visual theme-tracking, too. Explanations, analysis, and visualizations of Brown Girl Dreaming's themes. 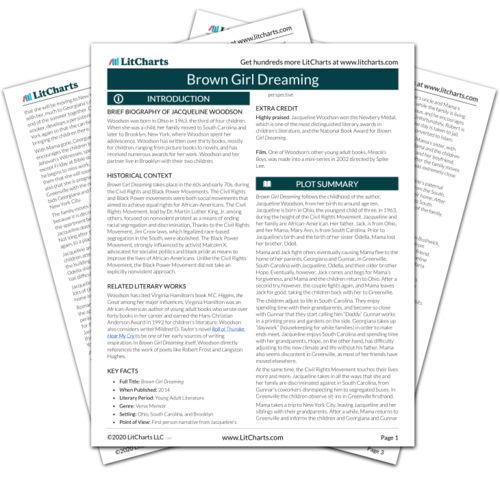 Brown Girl Dreaming's important quotes, sortable by theme, character, or Part. Description, analysis, and timelines for Brown Girl Dreaming's characters. Explanations of Brown Girl Dreaming's symbols, and tracking of where they appear. An interactive data visualization of Brown Girl Dreaming's plot and themes. Woodson was born in Ohio in 1963, the third of four children. When she was a child, her family moved to South Carolina and later to Brooklyn, New York, where Woodson spent her adolescence. Woodson has written over thirty books, mostly for children, ranging from picture books to novels, and has received numerous awards for her work. Woodson and her partner live in Brooklyn with their two children. Brown Girl Dreaming takes place in the 60s and early 70s, during the Civil Rights and Black Power Movements. The Civil Rights and Black Power movements were both social movements that aimed to achieve equal rights for African-Americans. The Civil Rights Movement, lead by Dr. Martin Luther King, Jr. among others, focused on nonviolent protest as a means of ending racial segregation and discrimination. Thanks to the Civil Rights Movement, Jim Crow laws, which legalized race-based segregation in the South, were abolished. The Black Power Movement, strongly influenced by activist Malcolm X, advocated for socialist politics and black pride as means to improve the lives of African-Americans. Unlike the Civil Rights Movement, the Black Power Movement did not take an explicitly nonviolent approach. Woodson has cited Virginia Hamilton’s book M.C. Higgins, the Great among her major influences. Virginia Hamilton was an African-American author of young adult books who wrote over forty books in her career and earned the Hans Christian Anderson Award in 1992 for children’s literature. Woodson also considers writer Mildred D. Taylor’s novel Roll of Thunder, Hear My Cry to be one of her early sources of writing inspiration. In Brown Girl Dreaming itself, Woodson directly references the work of poets like Robert Frost and Langston Hughes. Highly praised. Jacqueline Woodson won the Newbery Medal, which is one of the most distinguished literary awards in children’s literature, and the National Book Award for Brown Girl Dreaming. Film. One of Woodson’s other young adult books, Miracle’s Boys, was made into a mini-series in 2002 directed by Spike Lee. Churchill, Katherine. "Brown Girl Dreaming." LitCharts. LitCharts LLC, 7 Feb 2017. Web. 18 Apr 2019. Churchill, Katherine. "Brown Girl Dreaming." LitCharts LLC, February 7, 2017. Retrieved April 18, 2019. https://www.litcharts.com/lit/brown-girl-dreaming.